Roxy from Scotland. Sent 2 Jun 2017. I had a great time at Roxy's. Great value for money with amazing weed. Defo one of the best coffee shops. Al from Scotland. Sent 29 Mar 2015. Guy was very pleasant, not sure but think he's Eastern European. Place is not high class, bud tending as you enter, smoking area through door to the back where chilled sounds greet you but again just your basic style smoker. Comfy, good coffee but the cherry on the cake was his weeds & prices. Quality menu and been through 5 different weeds and all top notch, especially the Apple, wow the smell is apple the taste is apple but the effect is beautiful. Lovely high but can feel a head rush when fluffing away, perfect. 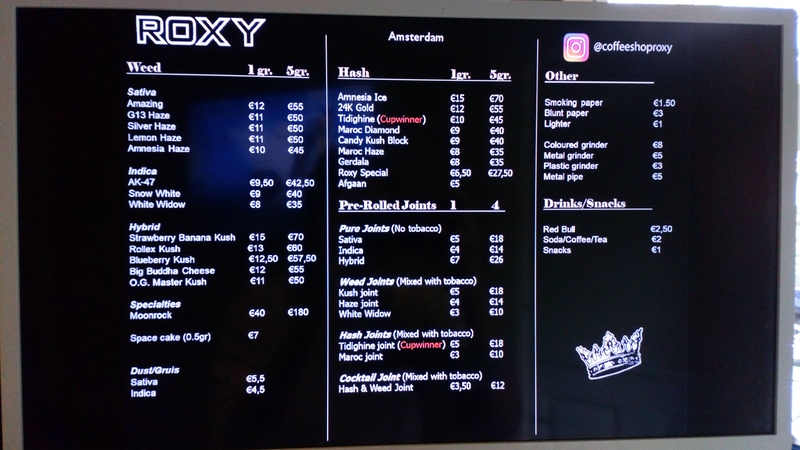 Prices are not the silly up town prices, they're all pretty similar around this part of town price wise 8, 9, 10€ a G unlike some crazy 16, 17, 18+ € a G uptown, red light areas for herb not as good or similar. Couple times I've been in it's been mostly locals, odd tourist but mainly locals which is always a good sign in my humble opinion. Sum up, yeah well worth looking this wee gem up and try that Apple.